If, over the past several years, you have had the privilege of joining the 3.3 million people that pass through Tokyo's Shinjuku station each day, you may have observed the work of Mr. Sato. 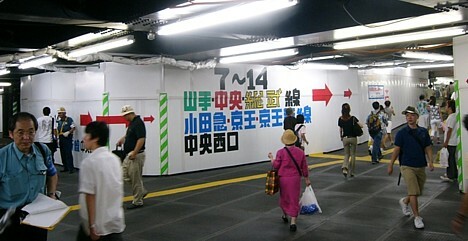 A construction worker by trade, Sato uses strips of adhesive tape to create elaborate makeshift signs that help people navigate the temporary chaos of ongoing renovation work at Shinjuku station. Sato's signs, which feature a peculiarly attractive gothic font, are the focus of a 15-minute documentary video put together by TrioFour, a small group of independent filmmakers. The video, which can be seen in two parts here (part 1, part 2), consists mainly of a long interview with Sato, entirely in Japanese (no subtitles), but it also shows lots of photos of his work from 2004. The photos below are still shots taken from the video. 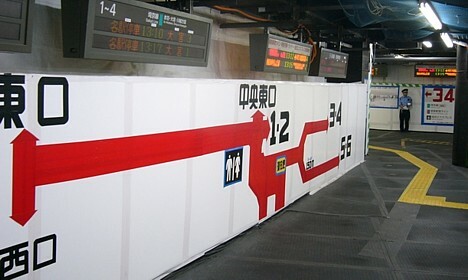 With his work at Shinjuku complete, Sato has boarded the Yamanote line and taken his adhesive tape sign creation skills to the now-under-renovation Nippori station. TrioFour followed him there and is working on a new documentary. UPDATE: More photos HERE and HERE. This strongly rembemeber me Evangelion's signage. There is, after all, only so many fonts that electrical tape is capable of conjuring. It is very nice to know the person and his un-selfish effort in helping millions each day! Thank You a lot!! Wishing you more success and energy !! That is brilliant! I'm travelling to Tokyo soon and I hope I see these signs - I haven't begun to learn the language yet! Doobybrain.com » Blog Archive » I need to start sleeping earlier.